Description: Stock Photo of Crater Lakes Blue Water. 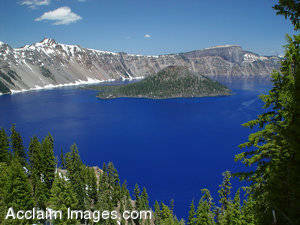 This image shows the crystal clear deep blue waters of Crater Lake in Southern Oregon. Crater Lake is the 7th deepest lake in the world. This photo is available as an art print or poster and may be licensed as stock photography.